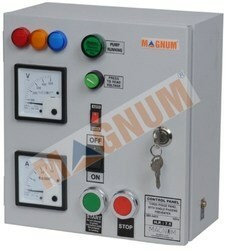 Magnum Three Phase Pump Control Panel Executive is a powerful controlling device for your submersible pump made with heavy duty components, it protects your pump from hazards caused due to over-current and voltage. Powder coated MS enclosure for corrosion resistance & sturdiness. 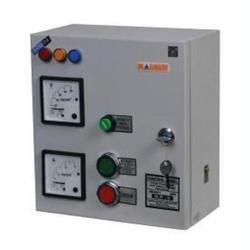 Rugged MaCH/ MaK-1/MaU Contactor with wide voltage band (220-440V). Fitted with MaCH/ MaK-1/MaU type relay for reliable overload protection. Indication lamps for motor running & voltage between the phases. Fitted with single phasing preventer & auto start unit which is used to switch on three phase motor/pump automatically & to protect them against wrong phase sequence & single phasing. Ergonomic design with aesthetic looks. No screw protruding from the Panel back. Hence additional safety from water, dust, corrosion and electric shock. Rugged MaK-1 Contactor with wide voltage band (220-440V). Fitted with MaK-1 type relay for reliable overload protection. Fitted with SZ-5 single phasing preventer & auto start unit which is used to switch on three phase motor/pump automatically & to protect them against wrong phase sequence & single phasing. Rugged MaCH Contactor with wide voltage band (220-440V). Fitted with MaCH type relay for reliable overload protection. Powder coated MS enclosure for corrosion resistance sturdiness. Rugged MaU Contactor with wide voltage band (220-440V). Fitted with MaU type relay for reliable overload protection. Indication lamps for motor running voltage between the phases. Fitted with single phasing preventer auto start unit which is used to switch on three phase motor/pump automatically to protect them against wrong phase sequence single phasing.